This is going to blow your mind. As part of the Mobile World Congress, Qualcomm (who make the processors for many Android phones as well as the communication chips in nearly all phones) set up test 5G networks in Frankfurt and San Francisco in order to see real-world results of 5G networking. The goal was to show what is possible with today’s technology. For that reason, they used frequencies that are already in use and hardware that could coexist with today’s technologies. What you’re seeing here is three gigabit speed. Even if the average person only got 1/10th of that speed reliably, it would still be three times faster than most people have in their homes. Put another way it’s about 100 times faster than the fastest download you’re likely to see on your phone today. Folks that’s fast. 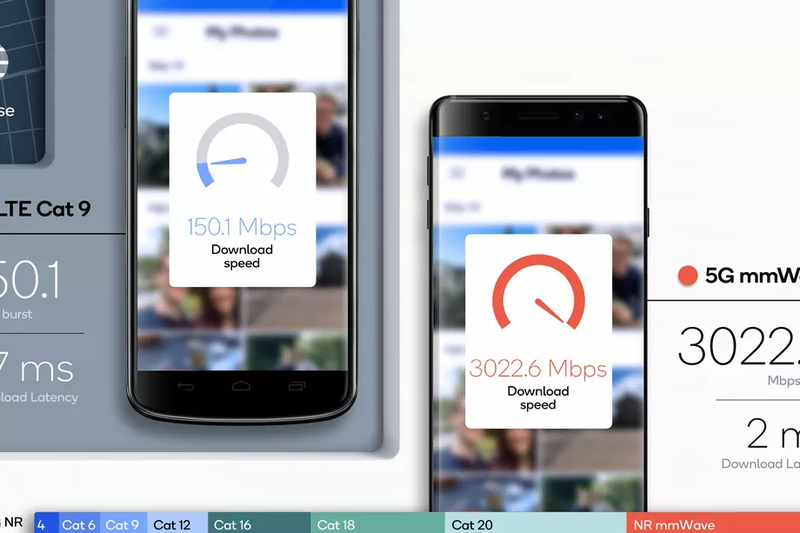 They went on to post additional comparisons, saying that in side-by-side testing, a person who got 71Mbps using today’s tech would get 1.4Gbps (20 times faster) using 5G. Now, I don’t know anyone who really gets 71Mbps on their phones but that’s not the point. If you’re an average person pulling about 20Mbps on your phone then this is saying that 5G would give you about 400Mbps. That’s enough to stream about 7 different 4K programs, completely wirelessly, at the same time. Seriously. Just because they weren’t done dropping good news on us, they reported that in their testing that 90% of users got at least 186Mbps, and the median user got 442Mbps. Those are business-class numbers, and we’re talking about cell phones here people. This is the promise of 5G — it’s overkill. Basically today you don’t need that kind of speed or capacity on your phone, but 5G represents the promise of replacing all internet communication with cellular. This means better, more reliable service, fewer problems with cities and towns, and most importantly, more competition. Right now your home is served by one or two high-speed providers. 5G could mean 7 companies competing for your dollar. Right now working from a cellular connection is possible but frustrating — 5G means that it’s as fast as working at the office. More importantly, hotels that ensure a good 5G signal to the room will finally be free of the burden of providing internet to guests, something that frankly, they stink at. 5G opens up a whole new possibility of services that could be available practically anywhere, and could make today’s data plans utterly obsolete. Carriers who plan for heavy usage of 5G stand to benefit the most and I think AT&T is far ahead here. Of course, the ability to deliver 5G is only part of the equation. Moving that much data through a phone is bound to take a lot of power, and as we all know today’s batteries aren’t up to the task. I’ve told the story before of how pathetic the battery life was on Sprint’s first 4G phone, and I fear that without some sort of real improvement here we’ll see something similar. 8K video isn’t much good if you can only stream ten minutes of it without plugging in. Still, that’s a problem for another day. Let’s rejoice in what Qualcomm has shown us: a future full of rich experiences, vibrant video, and no wires. Should you turn off cellular data to save battery? What is the best option for marine entertainment? Introducing the SureCall Flare Cell Booster! What is good signal strength on a cell phone?